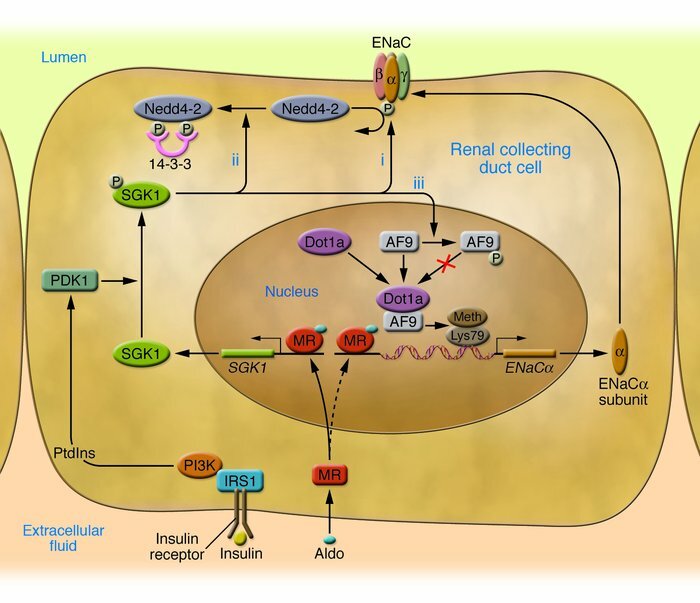 SGK1 acts at multiple levels to regulate ENaC-mediated Na+ transport in renal collecting duct cells. At low aldosterone (Aldo) levels, ENaCα gene transcription is low because of tonic inhibition by a complex of Dot1a and AF9, which methylates Lys79 on histone H3. At the same time, Nedd4-2 is active and maintains plasma membrane ENaCs at low levels through ubiquitinylation, which results in channel internalization and degradation. With an elevation in aldosterone levels, activated MR translocates to the nucleus, binds to MREs in the SGK1 5′ regulatory region, and rapidly stimulates SGK1 transcription (solid arrow). ENaCα is not initially responsive to aldosterone-activated MR because the Dot1a-AF9 complex maintains surrounding chromatin in a hypermethylated, stable state, which blocks entry of transcription factors, including MR itself, to their DNA-binding sites (dashed arrow). SGK1 catalytic activity is stimulated by PI3K-dependent generation of 3-phosphorylated phosphoinositides (PtdIns), which activate phosphoinositide-dependent protein kinase 1 (PDK1) and ultimately SGK1 itself. SGK1 activates ENaC through phosphorylation of several key substrates: the channel itself (i), resulting in increased open probability; Nedd4-2 (ii), resulting in inhibition of Nedd4-2 through recruitment of inhibitory 14-3-3 chaperone proteins and subsequent decreased channel internalization and degradation; and AF9 (iii), resulting in inhibition of the Dot1a-AF9 complex and diminished H3 hypermethylation in the vicinity of the ENaCα promoter. This latter effect, which is reported in this issue of the JCI (10), is predicted to enhance MR access to chromatin, binding to MREs, and stimulation of transcription. IRS1, insulin receptor substrate 1; Meth, methylation; α, β, γ, ENaCα, -β, and -γ subunits, respectively. Modified from ref. 10 and with permission from American Journal of Physiology. Renal Physiology (9).